Radon is an invisible, odorless, tasteless radioactive gas. It comes from the decay of the element radium and is present in varying amounts in most soils. Radon enters the home as it moves through the soil into basements or lowest levels of homes through cracks, loose pipe fittings, sump pits, dirt floors, slab joints, or block walls. In the outdoor air, radon becomes relatively harmless as it is diluted. However, once radon is trapped inside an enclosed space, radon can accumulate. The concentration of radon inside homes is dependent upon the amount of radon in the soil, the number of available paths into the building and the strength of the force drawing the radon into the building. Levels vary greatly from community to community, street to street and from home to home. Once in the home, radon easily attaches to other air particles and can inhaled. The inhaled radon products stay in the lungs and release tissue-damaging radiation. Radon does not cause headaches, nausea, sneezing and other symptoms normally caused by indoor air pollutants. Radon’s only known health effect is lung cancer after prolonged exposure to high levels. Radon is considered to be the leading cause of lung cancer among nonsmokers. Children are at a higher risk from long-term exposure because their lungs are still developing and the tissues are damaged more easily. Persons who smoke are also at about a 15 times great risk than a nonsmoker. In Nebraska, over 50% of homes test above the EPA (Environmental Protection Agency) “action level”. Last year this was mimicked in the NCDHD region as 50% of all tests conducted returned high. Every home in Nebraska should be tested for radon. Only individual testing can determine which homes may have a radon problem. Testing is very easy and test kits are available through the North Central District Health Department for the cost of $8.00 plus tax. They can be picked up at the NCDHD office at 422 East Douglas in O’Neill, at local farm and home shows, Northeast Nebraska RC & D in Plainview or they can be mailed to you. Online ordering is also available at www.ncdhd.ne.gov. With questions, or to place an order call NCDHD at 1-877-336-2406. The Northeast Nebraska RC&D Office is open Wednesdays, 10am to 4:30pm. Or you can call 402-582-4866 and leave message. The Northeast Nebraska Resource Conservation & Development (RC&D) Council is celebrating the New Year with a new face as Jocelyn Osborne has been selected as the Executive Director. She is replacing Jan Jorgensen who has served in the position since July 1993. Jocelyn is originally from South Sioux City, NE. She graduated from Morningside College in Sioux City, IA, in May of 2017 with degrees in English and Religious Studies. Following graduation she moved to Lincoln, NE, to serve as a Program Specialist with Lead Up, a nonprofit organization serving high-school students in Lincoln. She now resides in Sioux City, IA, with her husband and is very eager to begin her work with Northeast Nebraska RC&D. Recently the RC&D held their annual meeting at Serendipity Restaurant in Plainview. New officers for 2019 are Jim Rabe, President, Winside; Gary Howey, Vice-President, Hartington; Judy Rasmussen, Secretary, Plainview; and Justin D. Doerr, Treasurer, Plainview. Judy Rasmussen received the Outstanding Council Member award. Iris Dutton of Ponca was given a Special Effort award for the work she did on the 25th Anniversary Celebration. The Council recognized Mark Newman with a Farmers Market award as he’s provided live music during the Wednesday markets for the past two years. Janet Gill received a 13-year service award and Donna Christiansen was recognized for her willingness to help out at the office when needed. During the December meeting long-time board member Dennis Wacker’s resignation was accepted with regret since he and his wife will be moving out of the area soon. The RC&D will again partner with North Central District Health Department on the distribution of radon test kits. On Thursday, October 18th, the Northeast Nebraska RC&D sponsored a motor coach tour of Cedar County. Thirty people enjoyed visiting the impressive churches in Menominee, St. Helena, and Bow Valley. The group also enjoyed historic presentations at several cemeteries including; Immaculate Conception Cemetery, St. Helena Cemetery, and Wynot Cemetery. 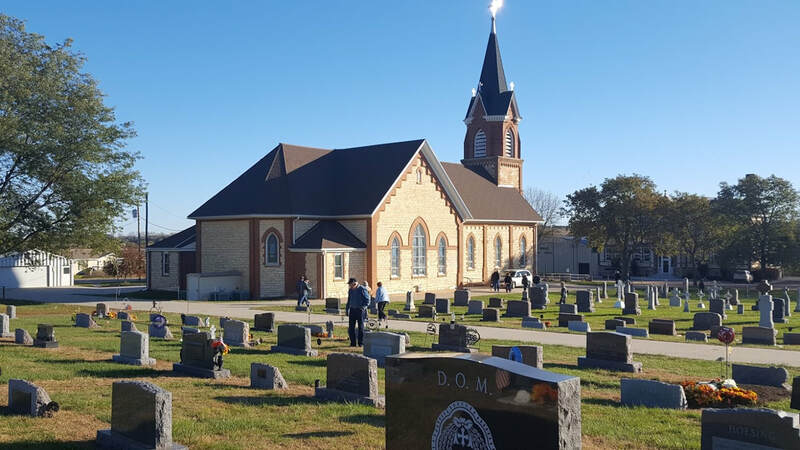 Guides, Brad Kellogg and Mary Rose Pinkelman, have both spent years researching the history of the area, and the group enjoyed their stories of the history of the communities, churches, and grave sites that were visited. The group finished their day at Nissen Winery with a wine-tasting accompanied by stories of the outlaws that once roamed the hills of Cedar County. Come join us in a one-day motor coach tour through the scenic, rolling hills of Cedar County. 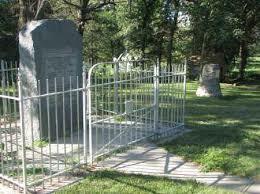 We will tour fabulous historic churches and stroll through historic pioneer cemeteries. Step-on Guides, Brad Kellogg and Mary Rose Pinkelman have spent years researching the history of the area and participants will learn about the unique heritage of Cedar County while listening to stories of people whose struggles and dreams helped shape an entire state. The Tour will be held on Thursday, October 18th. The bus will depart Navigator Motor Coaches in Norfolk at 7:15am; depart Jerry's Hilltop at 8:00am; or participants can check in at the park in Minominee before 8:45am. The cost of this tour is $55.00 per person and includes motor coach transportation, knowledgeable guides, noon meal at Donna's Diner in Wynot, wine tasting at Nissen's Winery, and all gratuities. The public is invited to help us celebrate 25 years of service to Northeast Nebraska at Ponca State Park on Sunday October 7, 2018. There will be an open house at the River Bluffs Room from 2-4pm with snacks and music. Then at 4pm there will be a hayrack ride ($4 adults / $2 children); Blacksmith Shop & Adams House Tour; and/or Barn Quilt Trail. We hope you will be able to join us for this informal event of reminiscing, refreshments, and tours afterwards. So, see you October 7th at Ponca State Park starting at 2pm! In this workshop, participants will learn from experienced beekeeper, Hank Scott, and learn about tools needed for beekeeping. Participants will also view natural habitat for bees and view beehives on location. 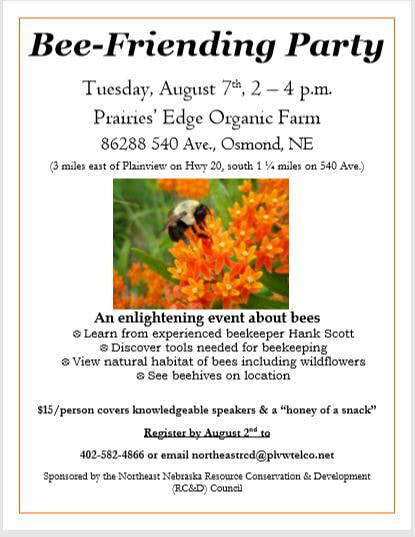 The cost is $15 per person and includes knowledgeable speakers and a "honey of a snack." Please register prior to August 2nd by calling 402-582-4866 or emailing northeastrcd@plvwtelco.net. Come celebrate Nebraska's heritage by visiting 11 northeast Nebraska museums between Memorial Day and Labor Day. Passport booklets can be obtained at participating museums. When you visit participating museums between Memorial Day weekend and Labor Day, hand them your Passport booklet. The museum staff will place a sticker over their listing on the center page. Persons collecting stickers from all 11 participating museums will be entered into a drawing for a cash prize of $300; stickers from 9 or more participating museums will be entered into a drawing for a cash prize of $100; and stickers from 5 or more participating museums will be entered into a drawing for a cash prize of $50. The 11 museums are: Antelope County Historical Museum in Neligh, Ashfall State Historical Park near Royal, Cedar County Historical Museum in Hartington, Creighton Historical Center in Creighton, Dixon County Museum in Allen, Graves Library Museum and Depot Railroad Museum in Wakefield, Mars Historical Area near Royal, Pierce Historical Museum in Pierce, Plainview Depot Railroad Museum in Plainview, Plainview Klown Doll Museum in Plainview, and the Verdigre Heritage Museum in Verdigre. The Passport to Heritage Project is sponsored by The Northeast Nebraska RC&D and is funded by the participating museums and the following: Mary's Restaurant in Plainview, Green Gables Restaurant near Royal, Gragerts Grocery Store in Creighton, Northern Nebraska United Mutual Insurance Company in Plainview, Dixon County Museum in Allen, Wakefield Heritage Organization in Wakefield, Mars Historical Area near Royal, Verdigre Heritage Museum in Verdigre, Royal Last Chance Bar & Grill in Royal, Dusty's Convenience Store in Orchard, Midwest Bank in Plainview, Madison County Bank in Plainview, J's Place in Pierce, Cobblestone Inn & Suites in Hartington, Tom's Service in Pierce, Boyd's Electrical Service of Clearwater, Brockhaus Funeral Homes of Creighton, Pizza Hut in Hartington, and McNally Law Office in Neligh. Click on Button below to view and print your Passport Booklet. The Northeast Nebraska Resource Conservation & Development (RC&D) Council in partnership with the Northeast Nebraska Weed Management Area (NNWMA) is hosting an educational workshop and tour on Tuesday, May 22, 2018. This free event will be held at the Antelope County Courthouse basement meeting room, 501 Main St., from 9 a.m. until noon. No registration is required. Questions can be addressed to Bruce Ofe, Antelope County Weed Superintendent at 402-887-4659. 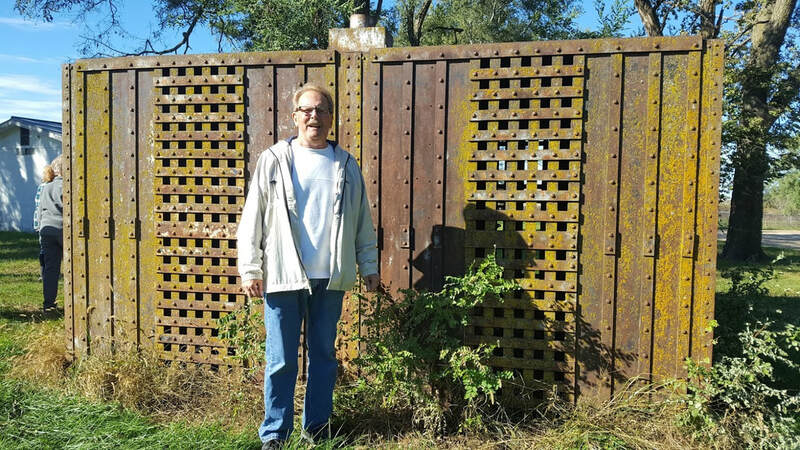 Landowners, County Board members, Natural Resource District Board members, and interested citizens are encouraged to attend this Weed Workshop. Topics will include the invasive Yellow Flag Iris, efforts with biocontrol agents in controlling noxious weeds, mechanical and chemical control of Salt Cedar, and accomplishments of the NNWMA. A tour to a site containing Yellow Flag Iris will complete the morning’s event which will then be followed by lunch. This project is funded in part by a grant from the Nebraska Environmental Trust. The NNWMA covers an eight-county area and 4,610,212 acres of private, public, and tribal land. NNWMA has technical support from the Northeast Nebraska RC&D, a local non-profit. On the early morning of Saturday, April 7th, a bus carrying 24 people journeyed to a pasture southwest of Naper, Nebraska to watch the male Sharp-tailed Grouse compete for the attention of the hens. As the sun began to rise, several male grouse began their elaborate calls and their courtship dances despite the temperature in the single digits. Several people took up positions in a photo blind that had been strategically set up by the Game & Parks Commission a couple weeks earlier. Other people watched the annual mating ritual of the grouse from the bus. Even though the birds seemed a little curious about the big yellow bus, they performed their dance within yards of the amazed visitors. A little after 8am, the bus left the lek area and drove into Naper where the group enjoyed a nice hot breakfast at the Naper Cafe. After breakfast, the group enjoyed informative presentations by Kelly & Jen Corman of the Northern Prairies Land Trust and Scott and Cassidy Wessel of the Nebraska Game & Parks Commission. Land owner, Larry Anderson, and Tessa Combs of NRCS also addressed the group on ways that landowners can work with State and Federal Agencies for conservation opportunities. The group then toured the White Horse Ranch Museum. The tour was sponsored by The Northeast Nebraska RC&D and North Central RC&D in partnership with the Nebraska Game & Parks, the Northern Prairies Land Trust, the Nebraska Natural Legacy Project, NRCS, and the Nebraska Environmental Trust.